In this article, I am going to show you how one can use the new Flow debugging technique that allows you to debug in the Cloud Flow Designer. Let us start with a business use case. Marie Gallagher is working as System administrator at GurukulOnCloud. He received a requirement from upper management to create a Flow that allows reps to create Lead and then associate it with a Campaign. This article is fully focused on the new debugging technique that allows you to debug the Flow in the Cloud Flow Designer. So I am not going to explain the steps to create the Flow for the above business requirement. But, for your reference, however, I have created an unmanaged package which you can install in your Org. For a deeper dive, view the following video and create a sample Flow! To start the debug process, click on the Debug button (only available in Summer’18 Orgs). Once you are done, click on the Run button. Pause – Pause your test/debug and resume it later. But note that ‘later’ means that it will open a normal Flow run screen, not debug screen with populated data. Run Again – Restart your test/debug from scratch or run it again with the same inputs that you previously entered. Once you are done with entering the lead data click on the Next button. It will create a lead and a Lead ID will be generated by the Flow. No need to add additional Screen element just to verify the outcome. Let’s take a negative scenario and see how this built-in debug tool helps when Flow fails at runtime. Re-run the complete debug process once again. To do so follow the steps 1-6. Yes! Wowed by the power of the new Debug tool? Me too! Having gone through the above exercise, now you understand how helpful this Debug tool in the Cloud Flow Designer is! Most of us would agree that it is better, quicker and easier way to debug a Flow – rather than setting up standard Debug Log and reading a convoluted mammoth log file. Whether you are testing a new flow or troubleshooting a flow that failed, the debug option in the Cloud Flow Designer is now your new best friend! Debugging or testing a flow actually runs the flow and performs actual actions – including any DML operations and Apex code execution. 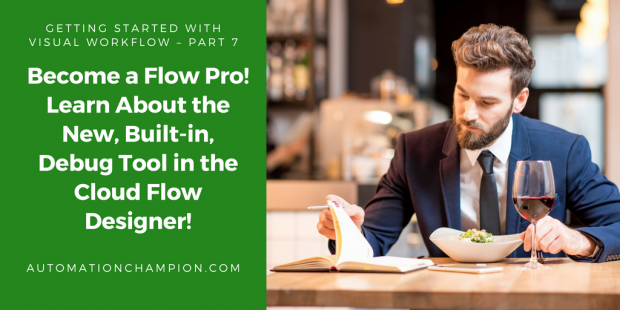 Remember, closing or restarting a running flow does not roll back its previously executed actions, callouts, and changes committed to the database. You can not pass values into input variables of type collection, sObject, and sObject Collection variable. Clicking Pause or executing a Wait element closes the flow and ends debugging. I hope you gained valuable insights from the blog about how to debug a Flow in the Cloud Flow Designer.!! Yes, go ahead! Show off your newly acquired skills to your friends, colleagues, and families!